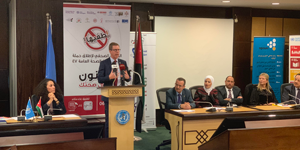 (Amman – January 20th 2019) - In response to the critical health situation and the diseases caused by tobacco products in Jordan, the tobacco control campaign organizing committee held a press conference launching the implementation of the second "Put it Out" campaign to enforce public health law 47 with the theme "The Law Protects Your Health”. This campaign aims at reinforcing the laws that prevent smoking in public areas such as governmental institutions, ministries, schools, hospitals and health centers, offices, restaurants and public transport. 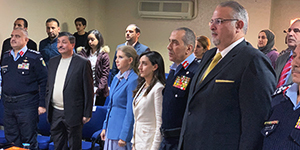 The press conference was held at the headquarters of the World Health Organization in Jordan, and was attended by a number of media personnel and journalists. The press conference was also attended by representatives of tobacco control stakeholders including: the Ministry of Health, the Greater Amman Municipality, the World Health Organization, the Royal Health Awareness Society, the King Hussein Cancer Foundation and Center, Tobacco Free Jordan, Lina and Green Hands Society, the Alliance of Jordanian Universities against Tobacco, the International Federation of Medical Students’ Association, and Jordan Anti-Smoking Society. The campaign is being launched as part of and with the support of Bloomberg Philanthropies Partnership for Healthy Cities and the FCTC 2030 Project (WHO Framework Convention on Tobacco Control). The campaign aims at highlighting Public Health Law 47 to citizens and the means to report violations of the law, via "Bekhedmetkom" application, or through the Ministry of Health Hotline, whereby a unique extension has been set up to report tobacco related violations. The detailed process was explained to the public by personnel in charge of both platforms. Dr. Hala Boukerdenna, Jordan's tobacco control official at the United Nations, commented that Jordan was one of the first countries to sign and implement the FCTC in 2004, and recently selected as part of 15 countries in the world for the FCTC 2030 project, which aims at encouraging the acceleration of the implementation of these provisions and laws. This is part of a three-year plan that aims at reducing the number of smokers, and the serious health consequences of tobacco use. Dr. Boukardena stressed on the importance of collaboration between the different parties in Jordan, which include, ministries, governmental institutions and the civil society, in order to achieve this goal. “Based on the decision of the UN General Assembly, the United Nations has banned smoking in all of its buildings throughout the world, including Jordan,” commented United Nations Resident/Humanitarian Coordinator in Jordan, Anders Pedersen. 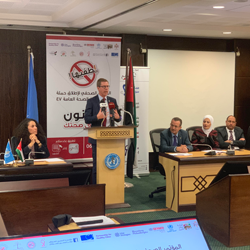 He also expressed the importance of reinforcing the law, as it greatly supports the country in achieving the 17 sustainable development goals, and the entirety of the United Nations organizations will work hand in hand towards a smoke-free Jordan. Pedersen continued by assuring that he will provide all the support needed for the Jordanian government to implement the no smoking law in public places, under the umbrella of the Public Health Law 47. " Tobacco use in Jordan creates a major health crisis, which threatens public health. It is also a major cause of deteriorating health and premature death and poses a major threat to sustainable economic development. The percentage of smokers in Joran is among the highest in the world, where the percentage of male smokers in 2015 was recorded at 70.2%, which is the highest number in the Middle East, and the second highest rate of male smokers in the world after Indonesia. In terms of secondhand smoking amongst adults and young people, more than 60% of non-smokers are subjected to secondhand smoking, where one out of three deaths is attributable to tobacco use according to the latest WHO statistics. This data is far worse than other countries in the world, where one out of ten deaths was recorded. Dr. Abeer Al Mowaswas, Director of Health Awareness and Communications Directorate at the Ministry of Health highlighted the role of the Ministry when it comes to the fight against smoking and tobacco use, as well as the implementation of Public Health Law No. 47 of the year 2008 and its amendments. Dr. Al Mowaswas also highlighted that penalties for violators have been increased between JOD 100 to 200, or imprisonment for one to three months. Dr. Al Mowaswas also stressed that this campaign is only one of many other programs and activities carried out by the Ministry related to smoking, and that it will continue to enforce this law at all levels, in order to provide smoke-free environments which will allow citizens to breath toxin free and fresh air. In order to implement the law rigorously, the Ministry has assigned anti-smoking liaison officers in all ministries and public institutions, to ensure that the law is being complied with; to date, 570 violations, 49 closures and more than 1,600 warnings have been issued. In addition, the Ministry is continuing with its awareness campaigns on the harmful effects of smoking and secondhand smoke in different institutions, ministries, schools and associations, where it is also providing counseling and free of charge smoking cessation services through five clinics; two located in Amman, and one in each of Zarqa, Irbid and Karak. The Ministry is keen on reviewing the smoking regulations and laws whenever necessary, in accordance with its obligations under the Framework Convention on Tobacco Control, which was endorsed by Jordan in 2004. A strategy has been set in line with the objectives of the 2030 convention. This includes a constant review of the laws and regulations, as well as, raising awareness by organizing events in malls, ministries and other locations. In addition, results of a study of the economic impact and burden of tobacco in Jordan will also be issued soon. Deputy City Manager for Health and Agriculture at the Greater Amman Municipality Dr. Mervat Al Mhairat commented that this campaign falls in line with GAM's ‘Amman Healthy City’ initiative, part of Bloomberg Philanthropies Partnership for Healthy Cities, with Vital Strategies as the implementing partner, and where Amman was chosen along with 50 other cities in the world to implement effective measures and interventions for tobacco control, and eventually aims at making Amman a smoke-free city. Through this partnership, GAM with Royal Health Awareness Society, implemented a number of tobacco control activities and interventions in Amman, such as: “Let our Parks Breathe” to ban smoking in three main public parks in Amman, and “Generations Breathing,” a competition and workshop that aims to raise awareness and create anti-Tobacco ambassadors among public school students in Amman, where 150 students participated from 6 schools. On the level of raising health awareness,18 lectures were conducted on the harmful effects of smoking and passive smoking for GAM employees, in addition to 20 lectures for recipients of services, reaching 1646 attendees. While the number of beneficiaries of the tobacco cessation clinics of GAM reached 392 from GAM staff. Dr. Al Mhairat also commented on the role that GAM plays in fining restaurants and cafes that are in violation of the law, where GAM has registered 982 fines and 257 warnings during 2018. The nature of the violations was as follows: The conditions of separation and the lack of applying the special requirements in the places that are permitted to serve waterpipes, warnings to GAM employees smoking in their offices, violations of the presence of youth under 18 years old in the places that offer tobacco products, in addition to violations of advertising and promotion of tobacco products, or serving tobacco products to minors. Worth noting that the number of restaurants/cafes that have implemented health separation instructions reached 200. Concluding the press conference, civil society representatives from NGOs and civil society stressed on the importance of implementing and reinforcing the law which protects the health of all Jordanians from secondhand smoking, let alone that it falls under the international agreements signed by Jordan in 2008. Civil Society emphasized the important role that the public and citizens will play in engaging and implementing this law, be it through abiding by the law, or reporting those who violate it via the available governmental platforms.